Individual Adult Runner (19 & Over) 5K $35	 $40	 Register Now! Individual Youth Runner (18 & Under) 5K $20	 $25	 Register Now! Group/Team Runners (4 people aged 19 or older) 5K $140	 $160	 Register Now! Free Shirt with entry! T-Shirt Sizes are NOT Guaranteed and shirts tend to fit big. * Regular Fee - End Date: 2016-10-05 11:59 P.M.
Sunday October 9, 2016 from 9:00 a.m. to 11:00 a.m.
Sunday October 9, 2016 from 1:00 p.m. to 3:00 p.m.
Monday October 10, 2016 from 6:00 a.m. to 7:15 a.m.
All runners are encouraged to arrive early to avoid delays. After you pick up your race kit, you will be shuttled by bus to the start line area. Last shuttle bus leaves at 7:25 am. 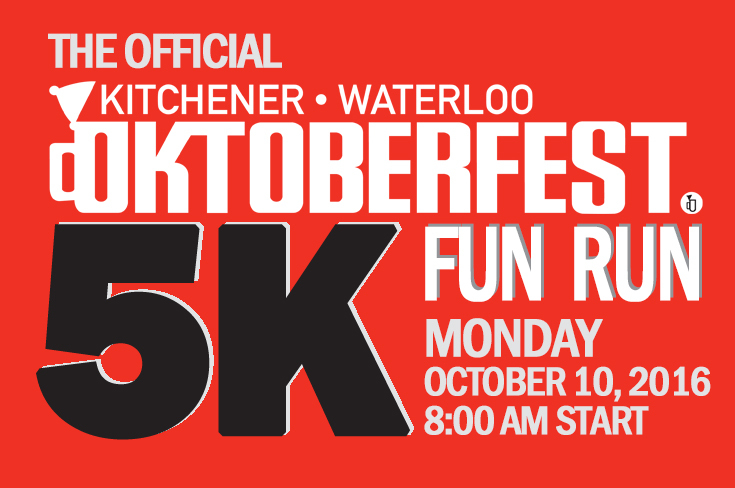 Your race kit will include your bib and timing chip, a t-shirt (guaranteed if registered before Sept 23rd) and your goodie bag, including a commemorative Kitchener-Waterloo Oktoberfest button and gifts from our race sponsors. Your bib will have a timing chip on it. The timing chip is disposable and does not need to be returned. The bib can be pinned (unmodified and fully-visible) to either the front or back of your shirt. Please be sure to write your full name, emergency contact information and any allergies or health conditions you have on the back of your race bib. Individual Adult Runner : Monday October 10, 2016 @ 8:00 A.M. Individual Youth Runner (16 & Under) : Monday October 10, 2016 @ 8:00 A.M.
Group/Team Runners (4 people) : Monday October 10, 2016 @ 8:00 A.M.